A study by ForwardKeys reveals that the imposition of new UN sanctions, followed by the ratcheting up of hostile rhetoric between Donald Trump and Kim Jong Un on 9th August, triggered a decline in tourism to Guam. It was then that Donald Trump warned that any threat to the USA would be met with “fire and fury” and Pyongyang responded, saying it was “carefully examining” a plan to strike Guam, home to a US military base. In the five weeks that followed, arrivals of people staying between four and twenty-one nights (a typical tourist visit), fell by 9%, with arrivals from Japan, traditionally Guam’s most important origin market, falling 30%. The fall in travel to Guam would have been much more substantial, were it not for a remarkable rise in enthusiasm for the Pacific island from South Korea. 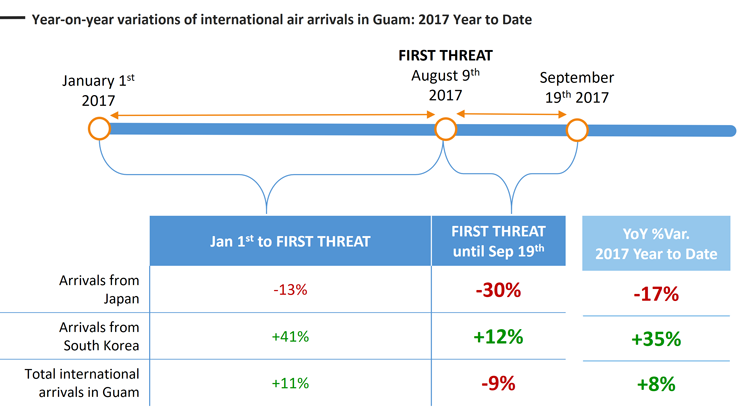 Prior to 9th August, arrivals in Guam were up 11% but that was due to a 41% increase in travel from South Korea, off-setting a 13% decline in visits from Japan. In producing its reports, ForwardKeys analyses more than 17m flight booking transactions a day, drawing data from all the major global air reservation systems and selected airlines and tour operators. This information is enhanced with further independent data sets, including flight search and official government statistics plus data science to paint a picture of who is travelling where and when, and to predict future travel patterns. Looking deeper at people’s plans to travel to Guam by analysing travel bookings made to date (for stays of the same duration), it is clear that after 9th August, overall bookings fell by 43%, benchmarked against the same period last year and bookings from Japan fell by 65%. By comparison, bookings from South Korea fell by 16%. 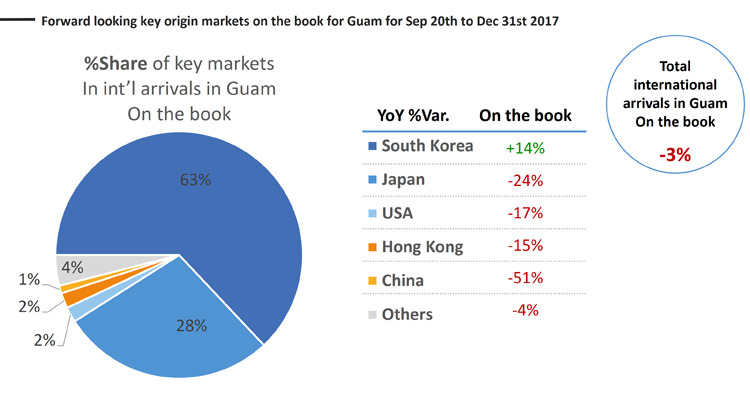 Looking ahead, by analysing the state of current bookings made for travel to Guam up to the end of the year, the current situation is that overall bookings are 3% behind where they were at the same time last year. Current bookings from Japan are 24% behind; from the USA, they are 17% behind; from Hong Kong, they are 15% behind and from China, they are 51% behind. However, on a much more encouraging note, current bookings from South Korea are 14% ahead. 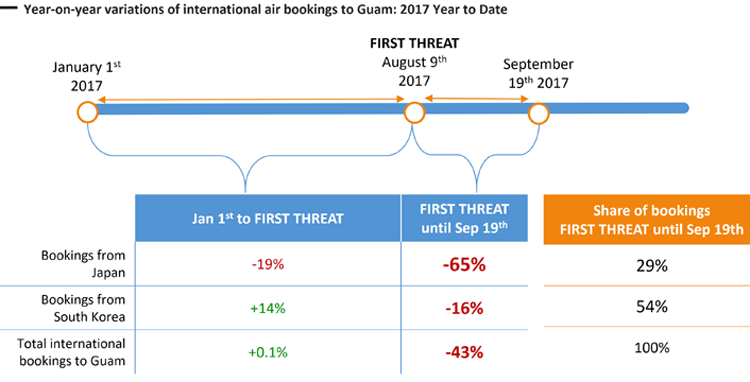 The strong growth in bookings can be partly attributed to increased air capacity between Guam and South Korea. From 13th September 2017, Air Seoul became the sixth carrier from Korea to provide direct services to Guam. The initial schedule is a five times weekly operation but Air Seoul will increase this to daily operations in October. Follow the winding route of the Danube and discover the lively history of one of Europe’s most important rivers. Cross the fertile plains of the Wachau Valley, where vineyards climb the slopes to imposing medieval Benedictine monasteries, perched atop the hills between Melk and Krems. Wind past castle ruins and apricot orchards before reaching the capital of Austria, where you can take in a performance of the ‘Blue Danube’ waltz, the melody that evokes Vienna the world over. Blue Danube Cycle departs April-October. Early Bird Deal from $1008 per person – normally $1120 per person (plus e-bike supplement). Starting from the mountains around Bolzano, pass the beauty of Lake Garda and wind through pretty meadows and orchards as you cycle past Venetian villas and through the historic Veneto region. Enjoy a wine tasting and taste exquisite Italian cheese while exploring the unique landscapes of the Venetian lagoon and taking in the architectural and cultural highlights of Trento, Verona, Vicenza, Padova and of course Venice. Backroads to Venice (8 days) departs March-October. Early Bird Deal from $1125 per person – normally $1250 per person (plus e-bike supplement). The Greenways cycle trails are a collection of routes linking Prague and Vienna. This undulating cycling trip follows the section south of Prague, from the hills of Cesky Krumlov to the east along the Austrian border. Passing numerous medieval towns where castles and impressive squares dominate, the route traverses forested national parks and wine country offering a full appreciation of this captivating pocket of the Czech Republic (or Czechia as the country is nowadays known). Cycle Prague to Vienna (8 days) departs April to October. Early Bird Deal from $1701 per person – normally $1890 (plus e-bike supplement). Experience the subtle landscapes and interesting villages on a gentle cycle through Catalonia, specially crafted for families. Pedal back into history, as you ride through Roman archways and Medieval squares. Visit two museums dedicated to the fabulous art of Dalí and discover the ancient history of Iberians and Romans who inhabited the area and, once out at the coast, you will enjoy sandy beaches, quiet coves and the beauty of the Mediterranean fishing villages. Catalonia by bike (8 days) departs March-October. Early Bird Deal from $1125 per person – normally from $1250 per person (plus e-bike supplement). This trip begins in Dubrovnik, the Adriatic’s stunningly intact walled city, and extends westerly into the Mediterranean, exploring the loosely connected islands of southern Dalmatia. Based on a comfortable boat, you will visit Hvar, Korcula and Mljet and discover the unique features of each island. Highlights include the wine making traditions of the Pelješac Peninsula, the medieval town of Hvar and the historic island of Vis occupied by the Greeks more than 2,000 years ago. Dubrovnik and the Dalmatian Coast – Deluxe (8 days) departs May-October. Early Bird Deal from $2151 per person (plus ebike supplement) – normally $2390 per person. *Upgrading to an e-bike with UTracks costs from $130 per person. Quoted prices are inclusive of accommodation, most meals, equipment rental, experienced guides, luggage transfers between hotels (where applicable) and clear maps with images.